The Berman Institute will be well represented at the 18th annual meeting of the American Society for Bioethics and Humanities (ASBH), as a group of faculty, staff and trainees are headed to Washington, DC October 6-9. In addition to visiting our booth (8) in the ASBH exhibit hall, check out our diverse presentations (see below, and you can access the full program online). You can also follow us on Twitter: #ASBH16, with our @bermaninstitute, @aregenberg, @tnrethx, @texaskiddoc, @fabioethics, @zackbergerMDPhD, @kahnethx, and more. Empirical and conceptual research projects applying to a diverse range of biomedical and clinical contexts are an important aspect of bioethics scholarship. The shifting federal funding landscape can make it challenging to know where the bioethics grant opportunities are, and how best to position an application to be competitive. Funding for bioethics projects, like other federally-supported research, involves a complex grant application process that is challenging for new and experienced applicants alike. In addition, bioethics research poses special challenges because the design, structure, and methodologies used differ significantly from most scientific projects-yet all must conform to the same grantsmanship standards. There also may be misconceptions about the grants process which wrongly discourage bioethicists from applying for funding. Unlike other fields in biomedicine, bioethics training does not typically incorporate research grant experience through which bioethicists learn how to manage these issues. Therefore this session aims to provide tools and insights for planning a bioethics research project, navigating the grant application process, learning how to be creative in framing a project, and understanding peer review. This interactive workshop will be facilitated by experienced federal program officers as well as funded bioethics researchers. The half-day will include brief panel remarks to frame the issues, opportunities for direct engagement with funders and researchers, and small group work to provide more tailored feedback and input on current research projects or ideas. This session is targeted at both junior and mid-career bioethicists who are interested in growing experience and sustaining a career in funded bioethics research. Zika infection has emerged as an international public health crisis. Pregnancy is a defining feature of the crisis, with the crux of concern stemming from the association between infection during pregnancy and congenital microcephaly and other fetal neurological compromises. Yet appreciation of the distinctive challenges, and critical needs, that pregnancy presents to the global health and research communities cannot be taken for granted. Concerns about the lack of access to contraception and abortion in several affected countries have been noted, but its granular implications for the ethics of research and clinical care have been poorly addressed. Given the difficulty of diagnosing microcephaly until late in gestation, a key question is how best to clinically support pregnant women facing decisions about abortion, legal or illegal, under uncertainty. As better diagnostics for the virus are tested, the ethics of disclosure under conditions of poor access to contraception will be critical. The historical reticence to use live vaccines in pregnancy raises crucial issues about priorities of investigating nonreplicable viruses for research dollars. And the world research community urgently needs concrete guidance on how to stage research on vaccines to pregnant women. This international panel, with representatives from both North and South America, will discuss these key challenges and identify priorities for the global health and research communities essential to an adequate and ethical response to the crisis. Local health departments (LHD) workers are at the heart of responses to infectious disease events, and researchers have examined their willingness to respond (WTR) to these emergencies. There has not yet been a robust examination of the ethical or associated legal implications of relevant insights. As part of a larger project, we conducted 4 focus groups with LHD workers in April and September 2014 (total participants=39). Participants were LHD staff and leadership. Findings indicate that a network of commitments informs LHD workers’ perceived responsibility as it relates to the community they serve, their employer, and their family. At the community level, the stronger the personal tie LHD workers have to their neighbors, the more likely they are to report their commitment to respond to a local outbreak. LHD leadership express their commitment to employees in varied ways: they lead by example; assure staff are properly trained; provide access to appropriate equipment; and assure priority access for staff and immediate family to vaccines and treatment. Staff express their commitment to employers with reference to contractual obligations and professional ethics codes. Participants also mentioned commitments to family and pets. Those with fewer familial responsibilities may be more WTR in an outbreak. Of course these commitments can conflict. In the hypothetical situation of a highly infectious disease with high rates of morbidity and mortality, staff are likely to put family needs over job security. LHD leadership may maximize WTR if they are aware of competing commitments and consider how to be mutually supportive. International guidance documents for the ethical conduct of human subjects research increasingly affirm that researchers owe post-trial obligations to participants. Justifications for post-trial obligations have appealed to multiple ethical principles, with varying implications for the scope and content of researchers’ responsibilities, as opposed to those of other stakeholders. Justifications grounded in the researcher-participant relationship most clearly implicate researchers, yet there remain concerns about the limits of these responsibilities; which benefits should researchers provide, and for how long? Further, recent empirical studies have shown that the implementation of post-trial benefit plans have been hindered by the complexities of coordinating drug manufacturers, regulatory authorities, national governments, and research sponsors, supporting the notion that researchers are one of multiple actors who share responsibilities for post-trial benefits. In this session, we raise the question of how responsiblities for post-trial benefits can be equitably distributed amongst the multiple stakeholders involved in a human subjects research trial. By systematically considering principles of distributing responsibility, including capacity, connection, and reliance, we develop a reasoned approach to limiting the scope of researchers’ responsibilities for post-trial benefits without necessarily compromising what is owed to participants. We argue that researchers’ post-trial obligations to participants may be appropriately discharged by transitioning responsibility to other actors or sets of actors, rather than fulfilling it directly. We propose that transitioning responsibility requires identifying and preparing other actors to accept post-trial responsibilities. This will take deliberate effort and investment, yet provides an ethically sound mechanism to limit researchers’ responsibilites for post-trial benefits. In contemporary bioethics, the autonomy of the patient has been granted considerable importance. Progressing from a more limited notion of informed consent, shared decision making calls upon patients to voice the desires and preferences of their authentic self, engaging in choice among alternatives as a way to exercise deeply held values. One influential opinion in Jewish bioethics holds that Jewish law, in contradistinction to secular bioethics, limits the patient’s exercise of autonomy only in those instances in which treatment choices are sensitive to preferences. We analyze a discussion in the Mishna, a foundational text of rabbinic Judaism, regarding patient autonomy in the setting of religiously mandated fasting, and commentaries in the Babylonian and Palestinian Talmuds, and have found both a more expansive notion of such autonomy and a potential metaphysical grounding for it in the importance of patient self-knowledge. Clinical practice guidelines are intended to optimize patient care by making recommendations for patient selection, diagnosis, referral, and treatment. But what happens to the standardization task of guidelines when the intervention is controversial, evidence for its long-term benefits and safety is limited, and the target population is adolescents undergoing rapid developmental changes? In this presentation, I ask whether guideline developers making recommendations for adolescent bariatric surgery have acquired too much critical distance from adolescents as a vulnerable population with extensive perioperative needs. Drawing on a systematic review of 21 recommendation documents published between 1991 and 2013, I focus on 11 guidelines that make recommendations for adolescent bariatric surgery. Since 2008, guideline developers have moved away from making comprehensive recommendations for adolescent bariatric perioperative care. This shift away from representing adolescents as a vulnerable population corresponds with the practice of combining adult and pediatric populations in the same guidelines, and the liberalization of BMI selection criteria for adolescent patients. The disappearance of the vulnerable adolescent in guidelines and the portrayal of adolescents as more like adults is taking place at a time when neurological evidence suggest that adolescent decisional immaturity extends into the mid-twenties. By blurring the distinctions between adolescents and adults, guidelines are moving in the opposite direction from the recognition that adolescents need extensive perioperative care. I will argue that guideline developers have a responsibility to serve pediatric clinicians and their patients by making recommendations around the core feature of adolescent bariatric surgery: the vulnerability of adolescents. This panel seeks to explore the way in which varying degrees of critical distance affect the ways in which we approach the ethics of research with animals. We will discuss how our different relationships with animals change the way in which we approach their use and protection in research. We will also consider whether there is an appropriate, uniform level of critical distance or whether it should vary by species as well as how anthropomorphism affects our critical distance.The panel will consist of four members: a philosopher who will discuss the analysis and recommendations of the IOM committee on use of chimpanzees in research and the implications of applying this approach to other animal species, a research ethicist who will examine challenges in selecting animal models for human disease, an interdisciplinary ethicist and former laboratory technician discussing the role of critical distance in the application of animal care regulations, and a researcher who will discuss the personal and professional impact of public criticism and ethics study on the perception of harms to animals in biomedical research.Some specific examples of the practical effects of these topics are: contradictions in the treatment of laboratory animals versus “pests” (i.e., mice and rats), discrepancies between treatments of animals of similar intelligence (i.e., dogs and pigs), how we go about choosing animal models for human disease, and our broader treatment of the great ape species. Drug shortages in the United States represent a new “normal.” Shortages of essential medications include life-saving chemotherapeutics, antibiotics, critical-care drugs, essential electrolytes/minerals, and even normal saline (salt-water). Drug shortages raise serious ethical concerns and directly affect patients’ lives. Shortages result in delayed administration of life-saving therapy, inferior outcomes, increased medication errors, and patient deaths. Drug shortages prevent clinicians from providing standard of care therapies and hamper important clinical research. Strategies to prevent shortages have yet to gain traction and a number of obstacles constrain these efforts. Until these shortages can be prevented through stakeholder engagement, a thoughtful and consistent response is necessary, yet physicians, and oncologists in particular, report a lack of formal guidance in making decisions about allocating scarce drugs. Existing prioritization frameworks fail to provide concrete guidance clinicians require when making difficult allocation decisions among equally deserving patients. Therefore, managing drug shortages requires stakeholder collaboration. Panelist one, a pharmaceutical executive, will discuss how manufacturers approach drug shortages, including proactive strategies companies can take to ensure ethical drug-prioritization. Panelist two, a senior government agency official tasked with monitoring and responding to drug shortages, will discuss government’s efforts to prevent and mitigate drug shortages, including interactions with manufacturers. Panelist three, a pediatric hematologist/oncologist and bioethicist, will describe a recently published ethical framework for allocation of scarce life-saving chemotherapy for childhood cancer that was endorsed by two major childhood cancer professional organizations. The moderator, an internist-bioethicist trained in philosophy/health policy, will guide the discussion by highlighting similarities and differences regarding responsibility and prioritization. Although the babies born to undocumented immigrants in the U.S. are American citizens at birth, undocumented women face many barriers to accessing prenatal care, including lack of insurance coverage. Over the past 15 years, states have adopted a variety of policies that attempt to provide access to prenatal care for immigrants who do not qualify for federal Medicaid due to their immigration status. These policies include (1) a state-funded Medicaid look-alike for all pregnant women regardless of immigration status; (2) extending CHIP to the unborn fetus of pregnant immigrants; and (3) no explicit policy beyond providing care at Federally Qualified Health Centers (FQHCs) on a sliding fee scale. These policies differ both in content and in the public moral justification used by policymakers when supporting or opposing their passage. This policy case study employs a qualitative content analysis method to compare state policy origin and content regarding the provision of publicly-funded prenatal care to undocumented immigrants. We examine the documents that comprise the legislative and judicial histories of the policies in three case states, one for each of the policies described above, with dual aims. The first is to determine the policy content, including funding streams and services covered. The second is to analyze the moral language employed in the public support or opposition to each state policy. We draw comparisons between the case states to characterize the variation in the policies and normative positions and suggest policy implications for these findings. Treatment has taken clear priority over prevention in most U.S. healthcare decisions. This priority has been mitigated partially by the Affordable Care Act, which eliminates copays and deductibles for A and B U.S. Preventive Services Task Force designated prevention modalities. However, many people believe prevention is still under-provided and under-prioritized compared with treatment throughout the western world. Unfortunately, few analyses have actually proven this under-estimation. One such analysis, performed in 2013, was an attempt by three health economists to estimate the correct balance of prevention and treatment for cardiovascular disease (CVD) [‘Tradeoffs in cardiovascular disease prevention, treatment, and research’ in Health Care Management Science 16(2):87]. This use of marginal cost-effectiveness analysis (CEA) was a particularly astute way of looking at the CVD cost-effectiveness horizon of both treatment and prevention and determining the crossing path of the two analyses.However, there are some glaring ethical issues when assuming this type of analysis as one that should inform resource allocation. Can prevention QALYs be equated with treatment QALYs? Does it make any sense to ‘discount’ lives? This session will examine the ethical issues underlying marginal cost-effectiveness analyses. For about a century, public and medical opinion concerning prescription opioids has swung back and forth between seeing these drugs as an under-used miracle, and an over-used poison. After seeing deaths involving prescription opioid use climb to more than 18,000 in 2014, the CDC has recently set out new guidelines for opioid prescribing in an attempt to curb what many are calling an ‘opioid epidemic’. Although certainly an important step in the right direction, cries have already been heard from the other side, who fear that such action will further harm chronic pain patients. Inspired by a diagnostic odyssey embarked on by two siblings and their ethicist-mother, a new interactive vignette-play provides a pedagogical approach to explore our profession’s standing from a safe distance through characters and scenarios that foster interprofessional discourse. Distinguished ASBH colleagues will perform the thirty-minute play, share reflections on their roles and commentary, and stimulate discussion with the audience and multidisciplinary ethicist-presenters (psychologist, attorney, nurse, and physician). Following each act, the audience will opine by “acting” as members of a mock ethics committee. The drama provides teachable moments by illuminating the complexity of ethical challenges in pediatrics—such as relaying bad news, dealing with uncertainty, issues of professional abandonment, blurred boundaries, and honesty with medical errors. Scenes spotlight the context-specific conundrum of critical distance and the diverse continuum of values and perspectives amongst members of the healthcare team and families, including what is viewed as an ‘ethical situation.’ Recognition of ethical dilemmas is brought to life so ‘outsiders’ to our field can better appreciate when to initiate a formal, or informal, ethics consult. Although ASBH colleagues and parents of pediatric patients are often relegated to ‘outsider’ status by the ‘insider’ medical providers, in fact members of the ethics-medical humanities community and families typically view themselves as ‘insiders.’ Our experience suggests that this vignette-play can be an effective educational tool to engage and shape expectations of ‘insiders’ and ‘outsiders’ with the goal of narrowing the critical distance between professionals, and families, to improve communication and health care as ASBH approaches new crossroads. The recent Ebola and Zika epidemics, and concerns about the potential for another SARS or avian flu outbreak, have demonstrated that infectious diseases can quickly become global threats as a result of increases in international travel and migration. Containment of infectious diseases depends on the ability of governments to work together effectively and within the bounds of public health laws and policies. Containment strategies include detection, notification, quarantine and isolation of actual or suspected cases; protection and monitoring of those not infected; and, potentially, treatment. Many of these measures are ethically contentious and difficult to implement. For example, people may resist isolation efforts that are thought to be implemented arbitrarily or inequitably. Therefore, public health preparedness in these contexts requires careful attention to ethics and to “where we stand” on the limits of individual rights. This multidisciplinary and multi-institutional panel will explore these issues. A philosopher will speak about ethically appropriate strategies for containing Ebola, with particular attention to low- and middle-income countries. A medical sociologist/sinologist will discuss strategies used in China to contain SARS and Avian Flu. A lawyer will explore how international and U.S. responses to Zika differ from those for SARS, Flu and Ebola, and the legal/ethical issues raised by recommendations that women in Zika countries prevent pregnancy despite limited availability of contraception and abortion. The session will conclude with a general discussion of the ethics of containment and the impact of emerging science for a range of infectious diseases that create public health burdens domestically and internationally. Engaging patients in their own care is rightly considered a benchmark of ethical medical practice. Recently, attention has also been paid to patient engagement in the design and operation of health care systems and their governance. Massachusetts requires hospitals to have patient and family advisory councils (PFACs), and Medicare requires its accountable care organizations (ACOs) to include a beneficiary representative on governance boards. Although intuitively the right thing to do, the ethical rationale for system- and organization-level engagement (SOLE) has been relatively unexplored. We examine five commonly cited rationales for SOLE: consequentialism (i.e., that engagement improves health care quality or costs), principlism (i.e., that it demonstrates respect for persons), deliberative democracy (i.e., that it is part of authentic deliberation), communitarianism (i.e., that engagement brings community values into health systems), and accountability for reasonableness (AFR, i.e., that it is part of legitimate decisions). These approaches either provide inadequate justification or would require radical restructuring of SOLE in the real world. For example, communitarianism assumes that patients constitute a community simply by virtue of where they receive care (an assumption that is questionable); AFR explicitly rejects SOLE as either ethically necessary or sufficient except in rare circumstances (e.g., when a representative is democratically elected). As a result, we propose a new minimalist rationale for SOLE: oversight. Understood as ensuring a patient is present to oversee organizational decision-making, oversight comports more with existing practices and—despite its minimalist conception—provides important practical advice for how to better structure SOLE activities. New medications are emerging that combine traditional medicines with an ingestible sensor to measure medication adherence. A pill with an embedded sensor sends a very short range signal (similar to an EKG), after it is swallowed, to a wearable patch/sensor that records when the pill was ingested and transmits that data to a patient’s mobile device. Although pill boxes that record when they are opened have been around for several years, these new pills represent a novel technology with the potential for broad ethical, societal, and legal ramifications. This panel will examine the ethical implications of ingestible sensor technology. The panelists will discuss the possible benefits for the treatment of chronic illness, potential challenges to the patient-physician relationship and trust, and the implications for society (law, privacy, and insurance) this technology represents. One panelist is a health law scholar and expert in mobile. One panelist is a geriatric psychiatrist and ethics researcher. One panelist is a bioethics/medical anthropologist and former technology journalist. The last panelist is a physician-ethicist interested in health reform. Families within the neonatal intensive care unit (NICU) are using social media as a tool to document and share the journeys of their critically ill infants. NICU parents form unique bonds with caregivers of children they have yet to care for themselves. After months in this environment, families of NICU graduates and their hospital caregivers have strong desires to remain connected; increasingly, social media platforms like Facebook, Instagram and Twitter are an important way families maintain ties and update caregivers on their children. For a generation of new parents (as well as nurses and physicians) already dependent on social media for maintaining connections it is not surprising social media has become an important outlet. Although use of social media as an advocacy tool has been embraced by professional organizations and providers are encouraged to use social media to grow their practices, direct connection of patients and providers through social media has been widely regarded as unprofessional. As use of this technology has grown, hospitals have responded by developing restrictive social media policies. Despite policies that prohibit interacting with patients, doctors and nurses continue to connect with NICU graduate families. The ways providers and patients are using these platforms, despite policies and concerns about professionalism, signify a need to revisit professional guidelines in the age of social media. Institutional policy should reflect the reality of ongoing social media use that is unlikely to stop, and providers need education in social media practices that appropriately reflect professional standards in a digital age. Of the 400,000 children in foster care in the United States, an estimated 10% are classified as medically fragile and may require multiple medications, numerous medical appointments, technology dependence, and recurrent hospitalizations. With such intensive care needs, often come frequent and difficult medical decisions.When a medical decision must be made for a child, typically parents are given authority to decide what is right for their individual child. But what happens for foster care children, who have been removed from their parent’s custody? Once parental rights have been terminated, then the state and/or court system is given legal authority to make medical decisions. Yet how can state officials and/or judges fully appreciate an individual child’s quality of life and goals of care to make such complex decisions? Are they at too much of a ‘critical distance?’Our first panelist, a neonatologist and bioethicist, will discuss caring for critically ill infants in state custody and the challenges that arise when making complex medical decisions. Our second panelist, the medical director of a care coordination program for children in foster care, will discuss how physicians, state agencies, and the legal system interact to make medical decisions, including whether or not to limit or withdraw care. The third panelist, a pediatrician and bioethics research fellow, will present the barriers created by current decision-making policy and propose an alternative decision-making model for medically complex foster care children—one that determines and assigns authority to the person(s) who truly represents the child’s best interests. 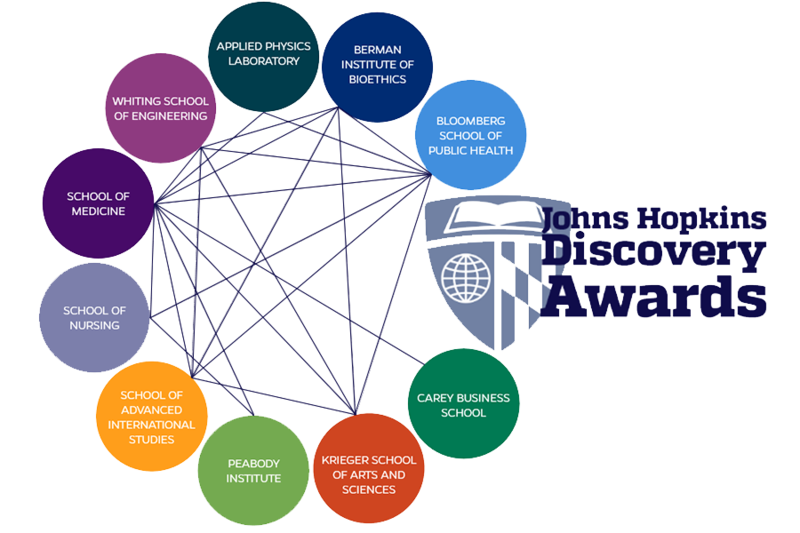 Twenty-four cross-divisional teams have been awarded Johns Hopkins Discovery Awardsto pursue innovative partnerships on collaborative research projects that bridge dozens of fields. With these awards, teams will be combining expertise in chemistry and electrical engineering to invent new photovoltaic materials; geriatric medicine and musical performance to improve quality of life for dementia patients and their caregivers; and molecular biology, neurobiology, and pathogen identification to develop a diagnostic device for detecting malaria by breath. In total, the 24 teams are composed of 84 faculty members and research scientists from across 10 Johns Hopkins schools and divisions. Daniels announced the Discovery Awards program, which will last for three years, in early 2015 along with Provost Robert C. Lieberman and the deans and directors of the academic divisions. Together with the Catalyst Awards program, the two programs represent a $15 million university commitment to faculty-led research. Teams could apply for up to $100,000 to explore a new area of collaborative work, or request up to $150,000 in project planning funds if they are preparing for an externally funded large-scale grant or cooperative agreement. All the teams are composed of members from at least two Johns Hopkins divisions. The awards were intended to spark new interactions among investigators across the university rather than support established projects. Senior faculty members from across the university were called upon to review the 167 proposals received. Twenty of the teams selected fall within the $100,000 category while four were chosen for the larger project planning awards. The broadest collaboration, which includes our Jessica Fanzo, draws upon expertise from the schools of Public Health, Engineering, Medicine, Arts and Sciences, Advanced International Studies, and the Berman Institute for Bioethics. That team seeks to reduce the global threat of antimicrobial resistance by creating a framework for countries to develop and implement policies that lower the use of antibiotics in food production. The full list of recipients and their projects is available on the Office of the Provost website.